All lanes of the inbound Interstate 290 were still shut down Thursday night because of a fatal crash in the afternoon near west suburban Elmhurst. 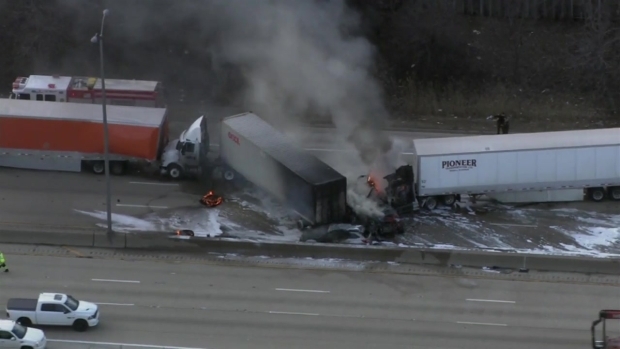 A fire broke out after three semi-trucks and four passenger vehicles crashed shortly before 2 p.m. in the eastbound lanes of I-290 east of St. Charles Road near Elmhurst, according to Illinois State Police. The vehicles included a red 2004 Chrysler car, a white 2018 Toyota van, a black 2016 Ford SUV and a gold 2016 Subaru. One person was killed in the crash, police said. Their identity hadn’t been released Thursday night. Two drivers were taken to Elmhurst Hospital and another was taken to Loyola University Medical Center in Maywood, police said. All three drivers were expected to survive, and all other drivers involved in the crash were treated at the scene. All eastbound lanes of I-290 were expected to remain closed until 5 a.m. Friday, and traffic was being diverted to North Avenue, according to state police. Westbound lanes were reopened Thursday evening. More details weren’t available as authorities continued to investigate the crash.